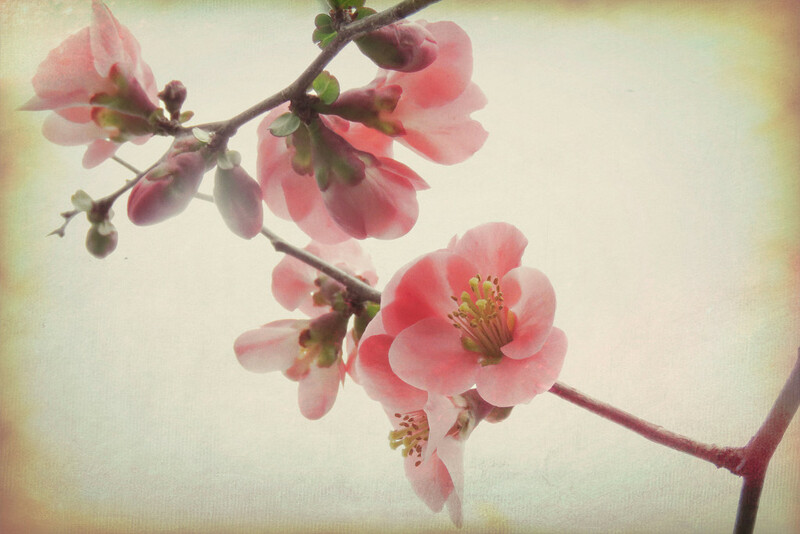 Applied a texture filter to this stem of japonica blooms - sort of gave it a Japanese feeling - nice and soft. Your processing does give this beauty an Asian feel. It is gorgeous! Lovely - and the processing is perfect! I agree with Lou Ann, this is magnificent, fav! I thought it looked Japanese before I read It! I like the soft tones and the textured background goes so well. Really nice processing love the soft feel and look it gives. Saw this on PP - absolutely gorgeous! fav! Pretty blooms and I like your processing! Fav! I love the softness of this picture! A Japanese feeling, for sure! This would make a lovely note card. I have no idea how to apply a texture, but I'd love to learn. Your project is so inspiring! @janetb This was using Topaz textures and finding one I liked and then lightening it a little. I'm not good at all on processing - it's got to be simple! @milaniet Thank you for the information, Milanie! FAV - one of my favourite flowers - lovely colour and beautifully processed. Fabulous composition and editing! Very deserving of it making the Top Twenty! FAV and CONGRATULATIONS!